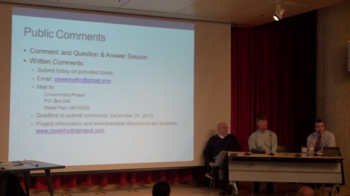 Crown Hydro, LLC, engineers and attorney at the Nov. 26 public meeting. Crown Hydro, LLC, is moving again on their effort to locate a hydro-electric facility at Upper St. Anthony Falls on the west bank of the Mississippi River in downtown Minneapolis. The company is trying to secure an amendment to their Federal Energy Regulatory Commission (FERC) license. As part of the process, they held a public meeting on Tuesday, Nov. 26 and are gathering public comments through Dec. 31. One major change to the project is that it would be located on land owned by the U.S. Army Corps of Engineers, rather than on land owned by the Minneapolis Park and Recreation Board (MPRB). The new project proposal would also include the creation of a tunnel under the Stone Arch Bridge and, at times, a dry Upper St. Anthony Falls spillway. Crown Hydro, LLC began the process of locating a hydro energy facility in the basement of the Crown Roller Mill building in 1994. They gained their FERC license in 1999 but failed to acquire the needed property. For several years after that, Crown made numerous attempts to gain access to MPRB land at Mill Ruins Park as an alternative location. When that failed they tried to make an end run around the Park Board by pursuing an eminent domain strategy and by asking the State Legislature to override MPRB’s authority. Those attempts did not work either. These strong-arm tactics were not appreciated by Park Board Commissioners, who have gone on record asking FERC to pull the outdated 20-year old license and require Crown Hydro to start over. In fact, FERC recommended the same thing at the outset of this amendment process, but Crown Hydro decided instead to forge ahead. The current Crown Hydro, LLC proposal presented at the public meeting is for a 3.2 megawatt hydropower facility on the U.S. Army Corp of Engineers property at the Upper St. Anthony Falls Lock and Dam. The facility will be 3,000 square feet above ground and require the creation of a new tunnel from the top to the bottom of the Upper St. Anthony Falls, beneath the Stone Arch Bridge. The proposed target construction date will be winter 2014-2015. Despite the fact that Crown held their public meeting two days before Thanksgiving, many citizens, MPRB commissioners and other stakeholders attended and many concerns were raised. Unfortunately, Crown Hydro was either unable or refused to answer most of the questions, frequently giving responses such as: “We are not able to provide that information at this time.” The meeting got somewhat contentious as angry neighbors expressed their distrust of the company and their disdain for the project. * Have there been studies done to ensure that the creation of the new tailrace tunnel under the Stone Arch Bridge will not create damage to the bridge during construction and into the future? * The Upper St. Anthony Falls has become a neighborhood, city, state, national, and international amenity. It is a major landmark within the Mississippi National River and Recreation Area – the only National Park focused on the Mississippi River. FERC should require a new license that takes into account the many current and planned park amenities and new local residents that did not exist at this location in the late 1990s. * Are there water level projections that account for future predicted trends (i.e., climate change, agriculture needs, population change, etc.) and increases in water use by other area hydro facilities since the last FERC license was granted that show that the Upper St. Anthony Falls spillway, a historically significant amenity, will not run dry? * Why is there not more transparency? * Who owns, works for, and represents Crown Hydro, LLC? * What are the project financials? Who is funding this? How much will it cost? Is the company set up to successfully implement this project? Can the project be sustained? * Will there be follow-through with the requests for information stated at the public meeting? Moving forward, how will we be kept apprised of the future developments and how can we know of them more in advance/sooner? This entry was posted in Crown Hydro on December 19, 2013 by citoyen1789.